Cardboard postage tubes - Supplied with plastic end plugs. Perfect for sending large format artwork, plans or posters through the postal system. Choose from a range of sizes to fit various sized paper including A0, A1, A2 and A3. 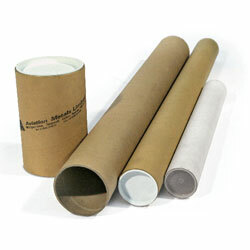 Our cardboard postal tubes come in a choice of pack sizes from 10 up to 25. Browse the range of postal tubes below. For sending large format artwork such as posters, plans or prints. 10 + packs - £2.69 per pack. 10 - 23 packs - £5.39 per pack. 10 + packs - £5.79 per pack. 10 + packs - £7.39 per pack. 10 + packs - £7.89 per pack. 10 + packs - £9.29 per pack.